You may notice my blog has a little different layout. I don't know why I hadn't already addressed this, but now is better than never. I have been following Marc Spagnuolo for about four or five years. I think I discovered him shortly after he entered the realm of woodworking podcasting. The guy is simply a genius. He is a constant student and never claims to know everything about woodworking, but he does knows a hell of a lot and he knows a hell of a lot of other great woodworkers, who know a hell of a lot. (Could I use "a hell of a lot" anymore?) He's accessible and his podcasts are the best on the internet and, in my opinion, the best woodworking shows period on or off the internet. I've been a member of The WoodWhisperer Guild since it's inception and although I don't usually build along with the projects that The Guild is making, the enormous amount of information make it very well worth the money spent to become a Guild member. Please take the time to to click the affiliate link on the right side of my page and peruse his Guild site. If you don't know who Marc is or the online presence he has built, check out the free The WoodWhisperer offerings: The WoodTalk Online site for a really great talk radio webcast featuring Marc, Matt Vanderlist of Matt's Basement Workshop, the Podfather of Woodworking and Shannon Rogers - The Renaissance Woodworker. On Woodtalk Online you'll also find a new radio show featuring Marc and Matt reviewing woodworking DVDs and giving them a rating of 1 to 5 "grape sodas"; The WoodTalk Online Forum, which is the most friendly woodworking forum you will visit. Mean spirited or overly judgmental people simply aren't welcome; Last, but not least, is the Live Chat/Live Stream page where you can chat in real time with fellow woodworkers and usually get a glimpse into one of the many shops that stream live via Ustream, including mine. All these sites can be reached via the main The WoodWhisperer site. Another addition is The Hand Tool School badge. 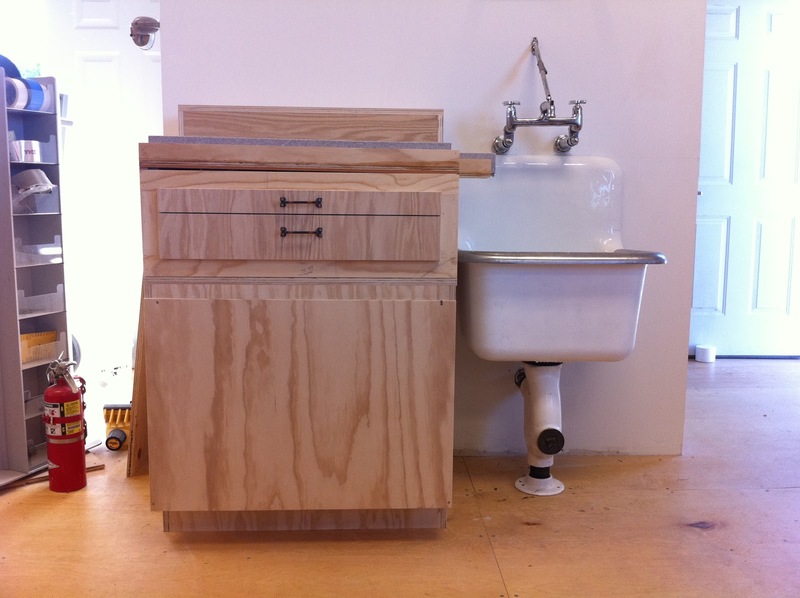 The Hand Tool School is the brain child of Shannon Rogers, mentioned above. The premise behind the school is to capture the apprentice experience as best we can in this cyber age. 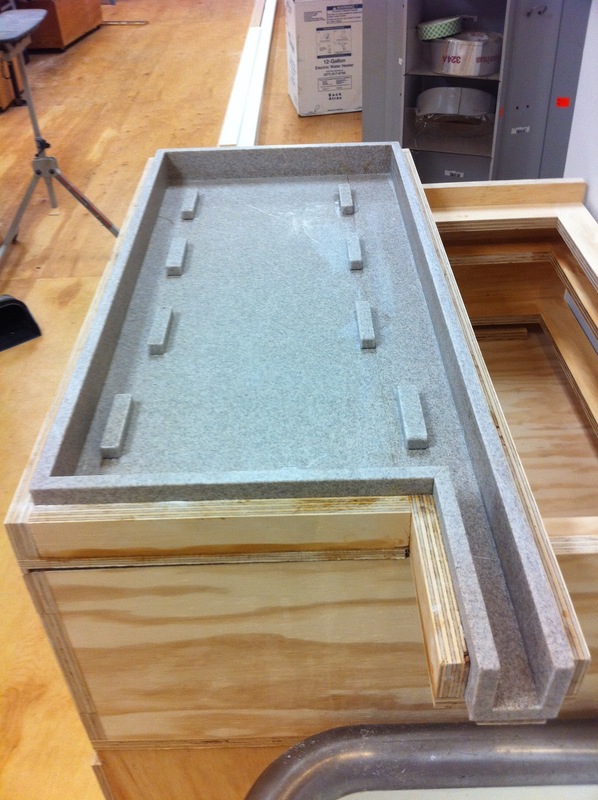 You will learn how to use hand tools, which is an essential aspect of creating fine furniture. While I'm what is referred to as a hybrid woodworker, which means I make furniture with both power and hand tools, all the fine tuning and fit is done with hand tools. 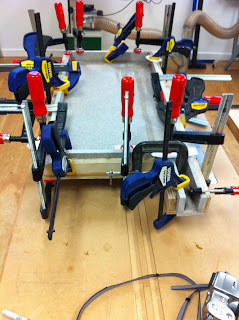 You simply can't set up any power tools to give you the fine fit and finish you can achieve with hand tools. If you love woodworking as much as I do, are a beginner or even a well skilled woodworker, you have a more available knowledge base than ever before. Take advantage of that. I hope to see you around the community I love so much. YEAH!!! SPRING IS FINALLY HERE!!! Spring brings mixed emotions. We had a very long winter and what has seemed to be a quite wet and extended spring has turned our very beige environment into a very green one. 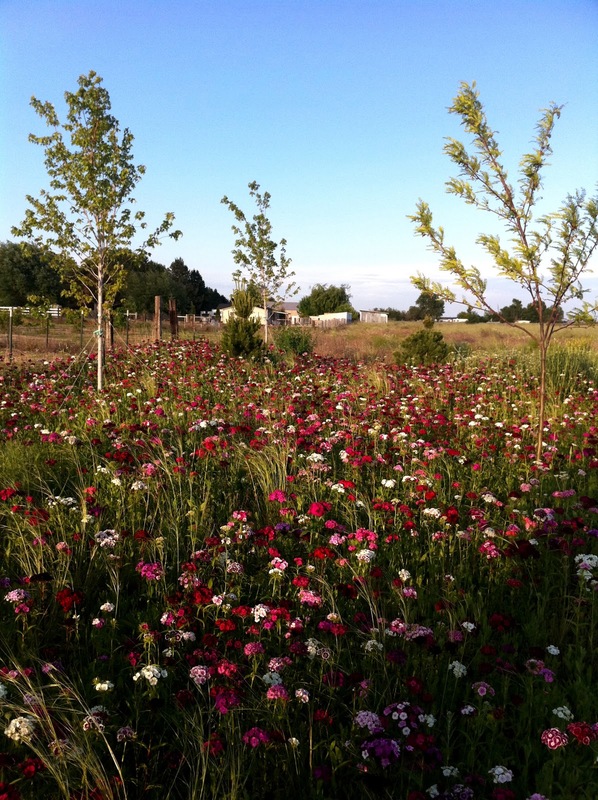 Sylvia's Garden that we planted last year with a bunch of trees and a perennial wildflower mix is vibrant! More than anything SUMMER IS ALMOST HERE!! Our summers here are great. The days are hot and the evenings are perfect for hanging out on the patio and taking evening swims. The flip side of that is I don't get into the shop nearly as much as I'd like, due to spring wake up and weekly maintenance chores. 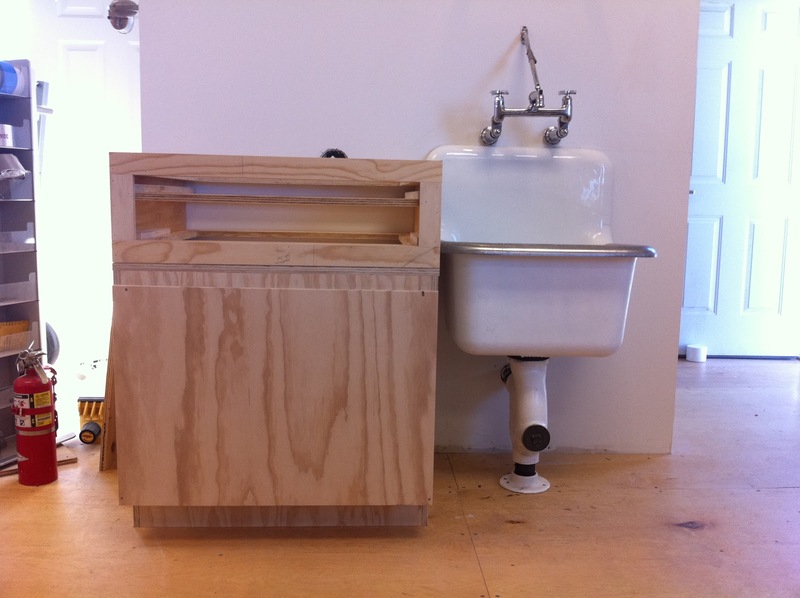 Here and there, I've managed to get into the shop and my latest project has been to install my deep sink and small hot water tank. 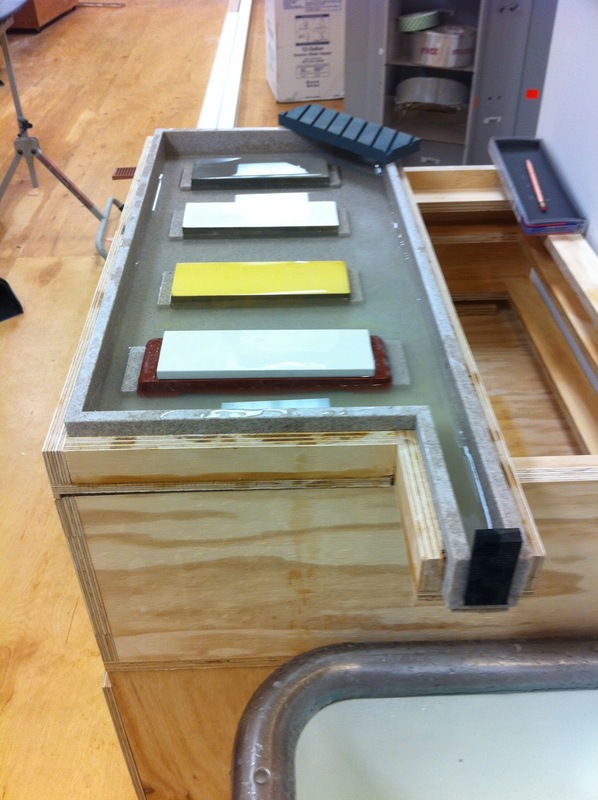 This, of course, facilitated a great place to have a sharpening station. To design this station, I took a few things into consideration. 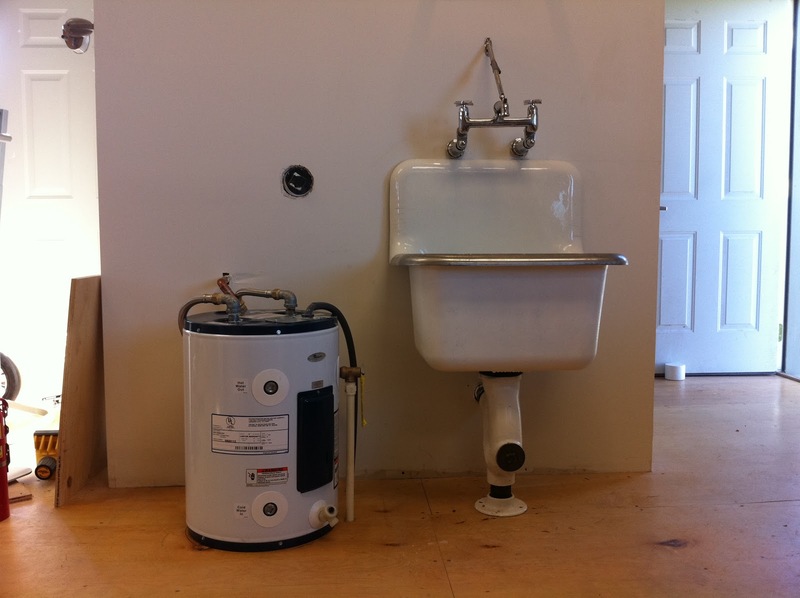 First, I wanted it to be modular to enable full access to the water tank for maintenance flushing and the sewer clean-out in case I ever need access to that. Second, I wanted this station to house all my sharpening arsenal, except the variable speed grinder, which will mount around the corner. 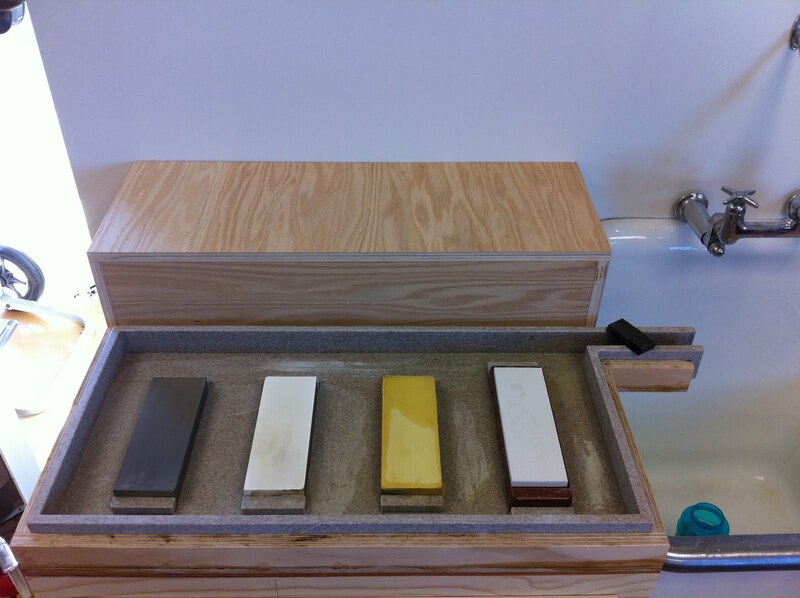 Finally, I wanted a no mess solution to my water stone sharpening regimen. 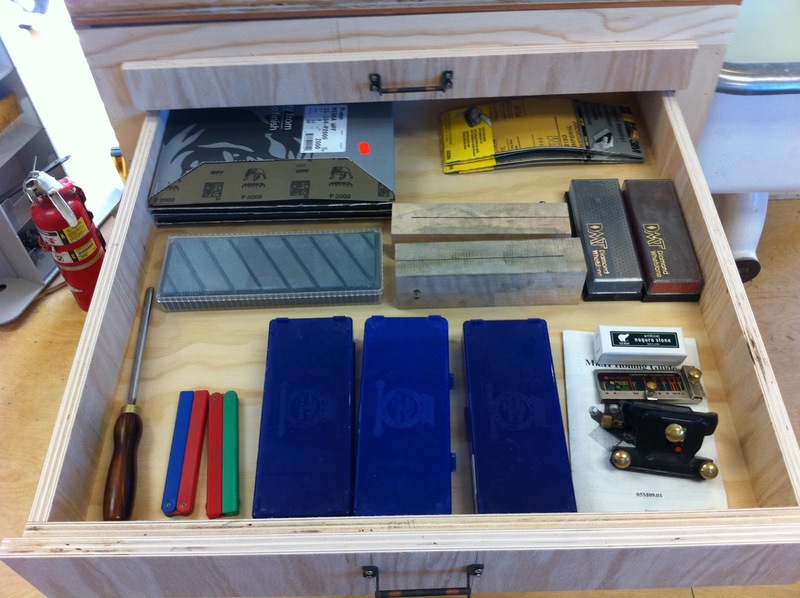 then the cabinet to house my sharpening tools and supplies. The drawers come later. 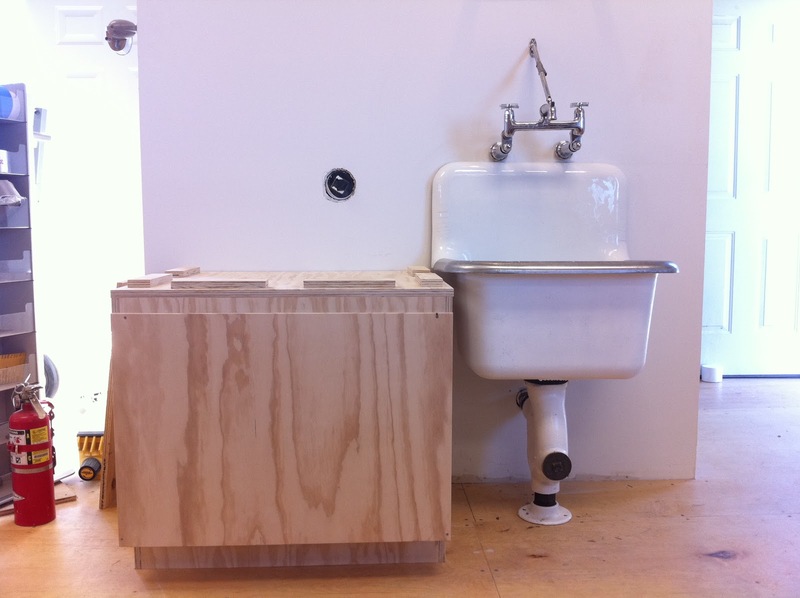 Next up was the sharpening basin. 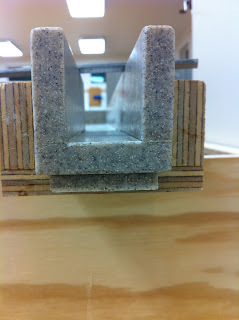 A buddy had an off-cut piece of Corian he let me have. 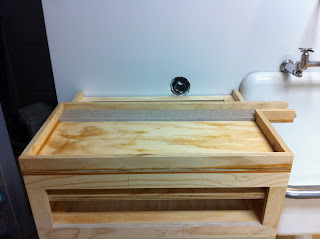 I was originally going to use it for the top of my upcoming router table, but I really liked the idea of using it here as it is impervious to water. The first thing I did was create a sub-base that I could more easily create the actual basin in. This was made 1/2" plywood for the bottom and 3/4" for the sides. For proper drainage I needed to create slope. 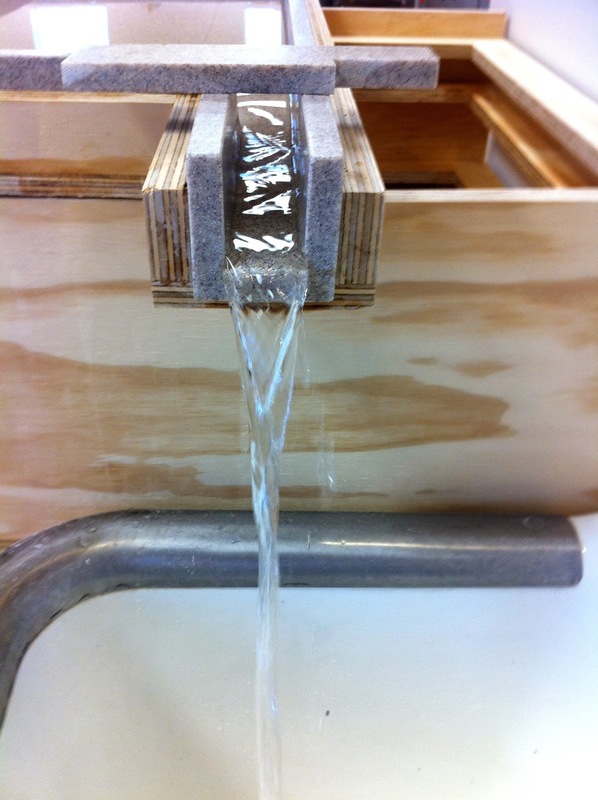 To do this I split the bottom of the basin. So, I cut the plywood bottom and then created a deep kerf to allow it to bend. 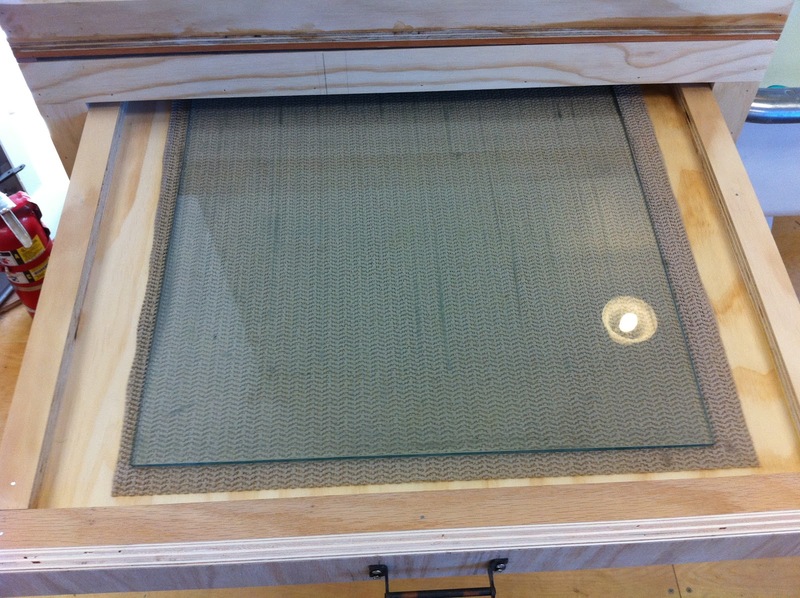 I also added a small strip of 1/8" plywood on the left and front side, then added the 3/4" sides. 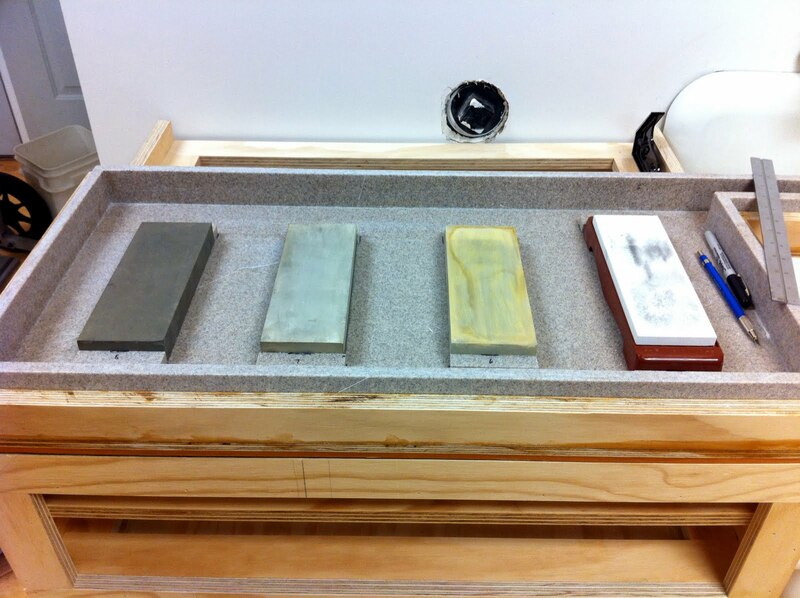 Now, I was ready to start cutting the Corian basin. 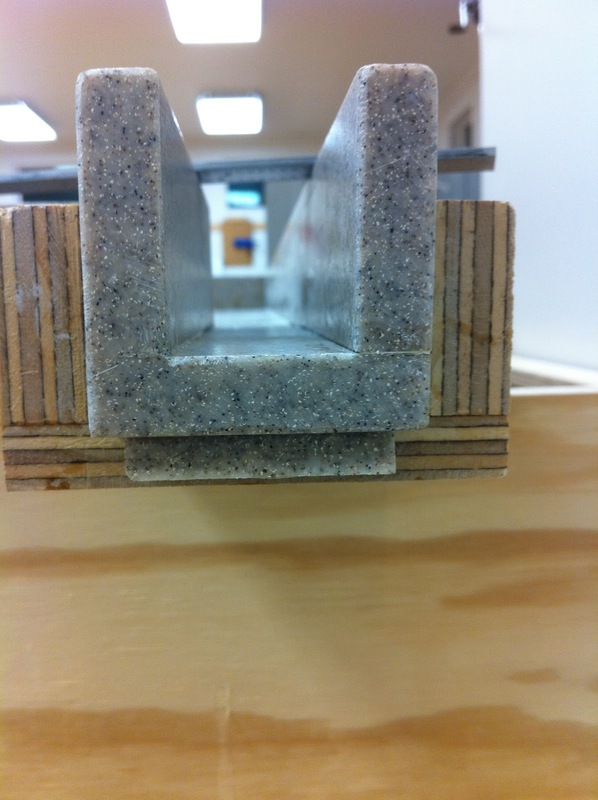 The first piece to fit was the thin strip shown here. Next I cut and fit the remaining pieces and glued them up. I used epoxy for a watertight seal and torqued the basin as much as I could without breaking it to allow the slope I wanted. After the glue up I tested it for leaks and proper drainage. 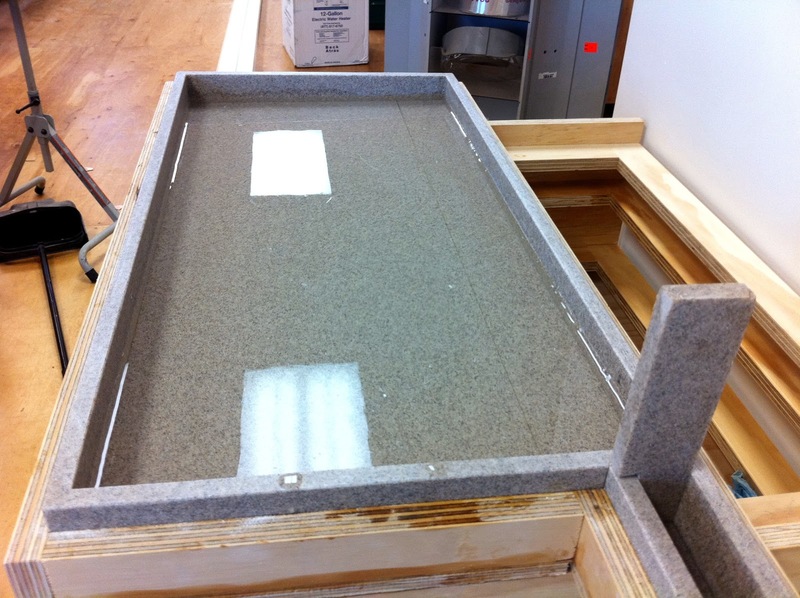 I also cut an other piece of Corian to be the dam for the basin. That didn't quite work, as you can see in this shot. It was a slow leak, but I'm kinda OCD and it wasn't good enough. Next up, stone holders. 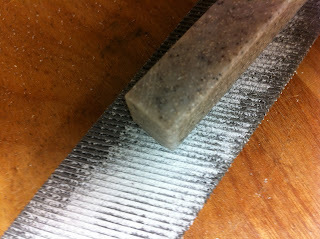 For cutting these little pieces I pulled out my crosscut sled. It was the only solution I could think of that I felt was a safe option for cutting these. 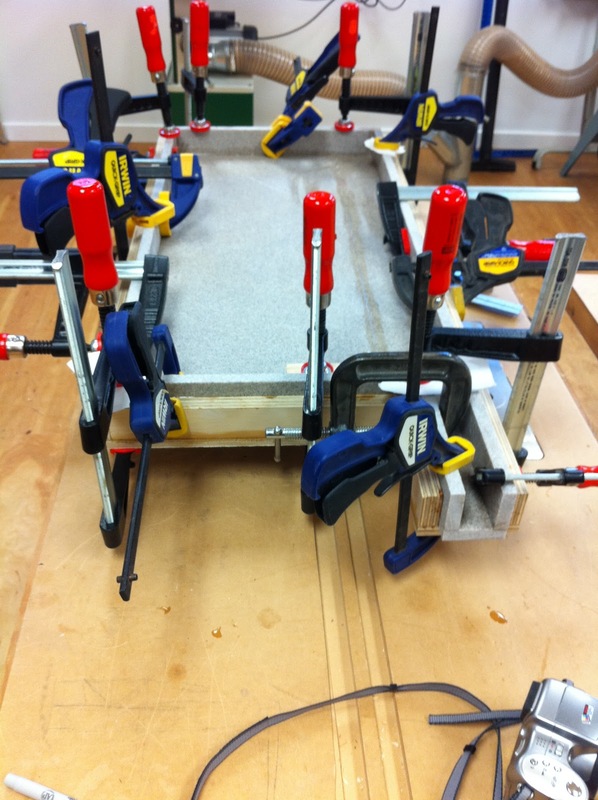 Then over to the basin to position and mark everything out for glue up. 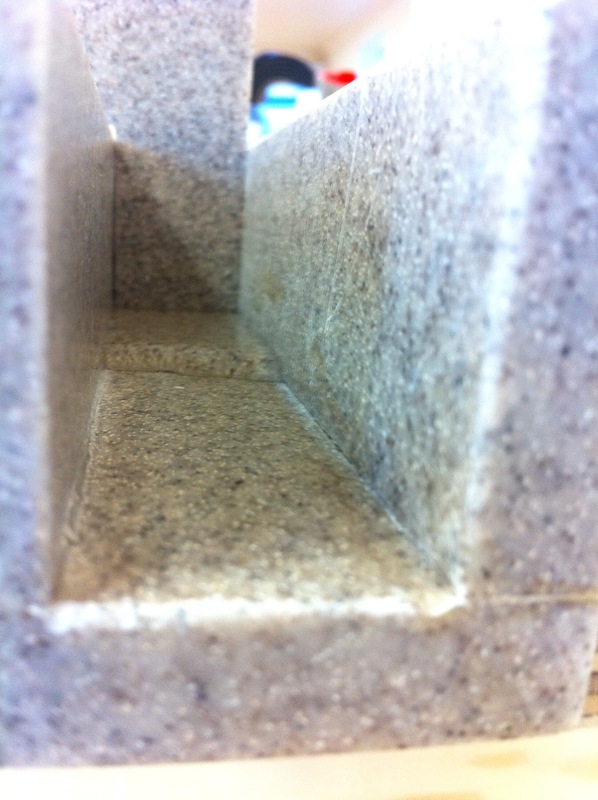 I used a file to round over the edges of the blocks, so they were less prone to chip in use. I used pure silicone sealant to adhere the blocks into place. 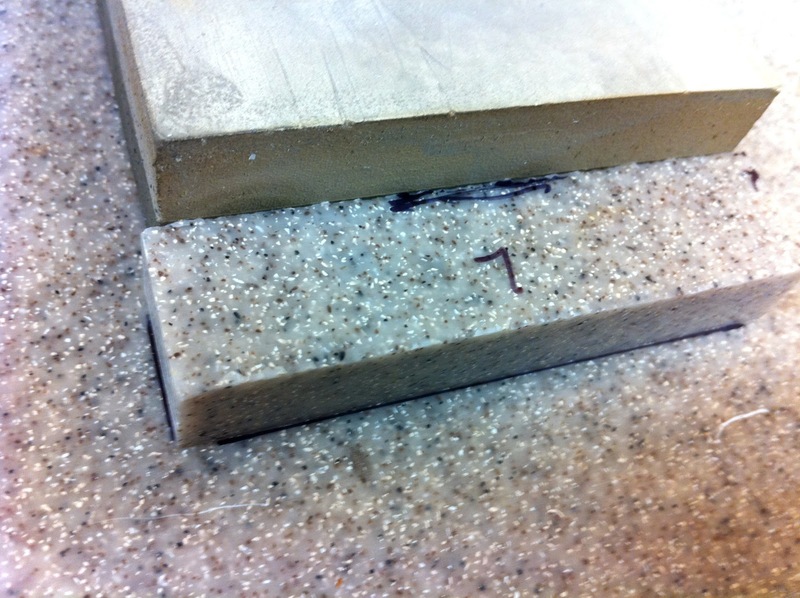 I preferred this over epoxy to allow me to remove them in the future if I get new water stones and they don't quite fit. 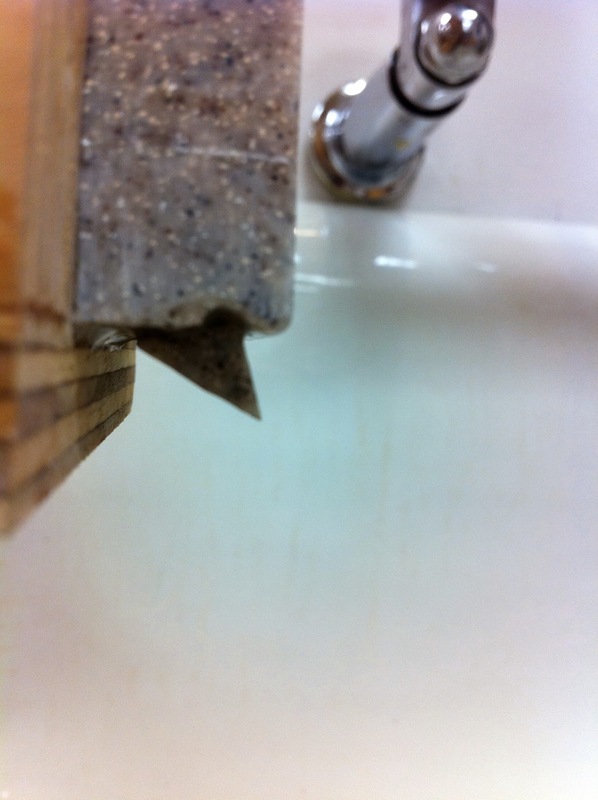 When I test the basin earlier for leaks and drainage, I noticed surface tension was making the water curl back around the end of the drain and get the wood wet. The solution to this was gluing on a little off-cut piece I still had. 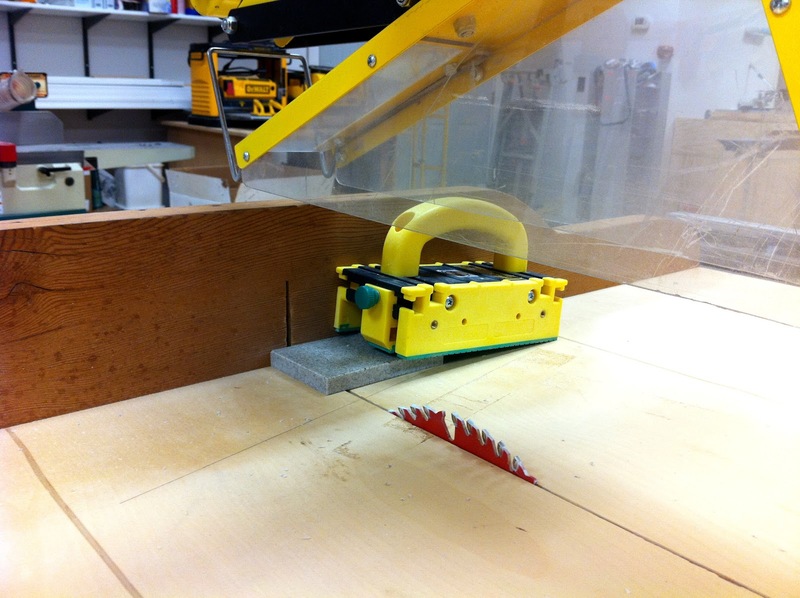 Before I said the dam I'd made of Corian wasn't quite cutting it. I scoured the shop and found an old foam rubber sanding block I never use and this worked perfectly. Here is the final product and everything in it's place! I know it's not pretty. It is, however, functional and it's just shop furniture. I think the only two nice pieces I will ever build for the shop are going to be my hand tool bench and my hand tool cabinet. Those two objects deserve a little more love and attention. The rest only needs to be utilitarian. Thanks for stopping by. I hope this has been helpful.